I wondered about this woman who looked so different – who, like me, didn’t seem to fit in. As it turned out, “not fitting in” was the story of her life. Marta told me she was Paraguayan, but her father was a Muslim of Arab descent, while her mother was raised Catholic. As a child, she had to choose between the two religions, and eventually decided in frustration to leave religion behind altogether. Since then, her life seemed to be a pattern of running away from troubling relationships, jobs, and circumstances. Although Marta was hesitant, at first, to discuss spirituality, she didn’t leave. We stayed on that stone bench, talking, for the better part of an hour, long after the DRIME team had packed up to go home. When we finally parted, she smiled and thanked me. I was reminded that no matter how far we think we’ve run from God, there is nowhere He won’t seek us and speak encouragement and love to us. Elena and Jennie went to Paraguay for six months to establish a DRIME base there. 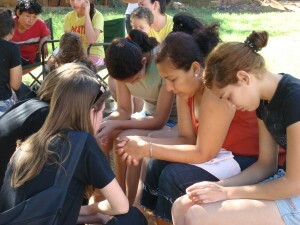 They trained four leaders and helped start the first DRIME Paraguay team. DRIME Paraguay was officially launched in December 2010 and in that first month of doing ministry on their own, they saw 28 people come to Christ!